What are the requirements for licensed gun owners? How do I store exempt quantities? How do I transport exempt quantities? What are the requirements for a carry box? 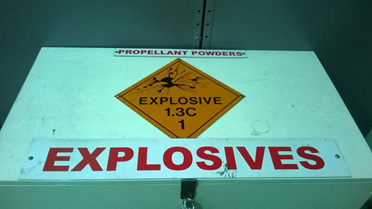 Black powder, propellant powder and ammunition are classed as explosives. To possess these items, authorisation is required from the Police Licensing Services under the Firearms Act 1973. Additionally, there are requirements under dangerous goods legislation regarding licensing, storage and transport. As long as an individual is storing and transporting black powder and propellant powder at or below exempt quantities for their personal use, dangerous goods licensing is not required. Ammunition does not require dangerous goods licensing. There is also the legislative requirement to store all these goods safely and securely, and a general duty to take all reasonably practicable measures to minimise risk during storage and transport. The United Nations (UN) dangerous goods classification scheme shows the hazards presented by the explosive properties of black powder, propellant powder and ammunition. The divisions reflect the hazard from very high for black powder (easy to accidentally ignite by impact, sparks or friction), to low for ammunition. The hazard presented affects the quantity and how the explosive is stored and handled. It is recommended that individuals store and transport black powder, propellant powder and ammunition separately, to avoid reclassification and licensing. any other materials likely to cause, spread or intensify fire. Black powder, propellant powder and ammunition must be kept safely and securely. Where possible they should be located away from residences, in a secure location protected from sources of risk (e.g. ignition, impact). These goods must be kept at or below exempt quantities within a carry box (or portable indoor magazine) that satisfies specific requirements (see What are the requirements for a carry box). If there are multiple carry boxes, they should be separated from each other (e.g. 5 m recommended). A person transporting black powder, propellant powder or ammunition for their own use should take the following preventative measures. Secure explosives in a carry box. Note: Except when the explosives are in sealed packages that are immobilised in an enclosed vehicle body (e.g. boot). Attach the carry box securely to the vehicle if not contained within an enclosed vehicle body. Do not stow explosives in, or have them accessible from, the passenger compartment. Take precautions to deal with emergencies and prevent the theft of explosives. Handle the carry box or packages carefully when loading and unloading the vehicle. Lockable (e.g. hasp) – a high security lock with secured keys to prevent access by unauthorised persons is recommended. Remain closed and locked when not in use. Stored in a locked room that is not in the way of emergency exits, but can be easily removed if required. Made from 19 mm plywood or hardwood, or a metal container that is wood lined. Note: Wooden boxes insulate from heat, protect from fire, do not allow friction which could generate sparks, and are built to allow pressure to escape. Screws and fittings inside the container should be covered and filled (to prevent sparks). Brass hinges and fittings should be used for the storage of black powder (to prevent sparks). Painted a light colour inside and out (so spillage can be seen and to prevent seepage into wood). the words ‘EXPLOSIVES’ (e.g. 75 mm letters) in red letters, and where appropriate ‘PROPELLANT POWDER’ or ‘BLACK POWDER’ (e.g. 25 mm letters). Note: Labelling advises emergency services of the danger so that, if safe to do so, carry boxes can be removed from fire situations. The design, security features and markings on a carry box are the same for storage as for transport. Transport of explosives on roads and at mines - guidance note outlines the regulatory requirements for the transport of explosives in Western Australia on both public roads and mine sites.